Blackpool police quickly found their Facebook feed inundated with replies and merriment after they posted an image of the man, who was the spitting image of the love-lorn US sitcom star. Police last month asked the public to identify a man who allegedly stole a crate of beer from a shop. 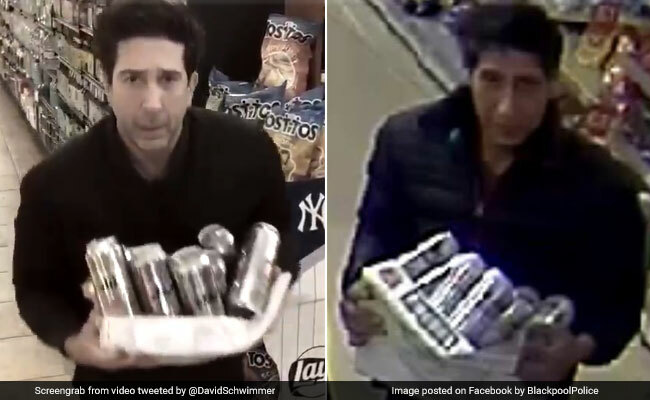 British police thanked "Friends" star David Schwimmer on Tuesday after arresting an alleged thief whose case went viral on social media because of his uncanny resemblance to the US actor. "Following the appeal we posted looking for a man who resembles a well-known actor, we now have an update," police in Blackpool in northwest England tweeted. "Thanks to our colleagues @MetPoliceUK, a 36-year-old man was arrested in Southall last night on suspicion of theft. Thank you for the support, especially @DavidSchwimmer!" They quickly found their Facebook feed inundated with replies and merriment after they posted an image of the man, who was the spitting image of the love-lorn US sitcom star. Police had reassured the public their investigation concluded Schwimmer had a solid alibi. But Schwimmer decided he would provide some hard evidence to back his claim, posting a video on his Twitter last month showing him in a US store... carrying off a crate of beers. "Officers, I swear it wasn't me," he quipped. "As you can see, I was in New York. To the hardworking Blackpool Police, good luck with the investigation." "Thanks for being there for us @DavidSchwimmer," the force replied on their own Twitter account.